Construction is underway along the A1A Drainage Project. This project includes the regarding and widening of the channel from Penman Road to the existing box culvert. The channel improvements include tree clearing, installation of sheet-pile wall and bedrock. Roadway crossings at 5th Street, Seagate Avenue, 18th Avenue North and 15th Avenue North will also be improved. Kings Road Bridge will also be replaced as a part of this project. Construction crews will begin their work on the channel from west to east and north to south along the channel. Below is a link to a graphic which shows the approximate phases of construction. The project will start at phase 6 and work in descending order except. The only exception to this is phase 7 (the Kinds Road Bridge replacement), which will take place simultaneously with phases 5B, 5A, 4 and 3. 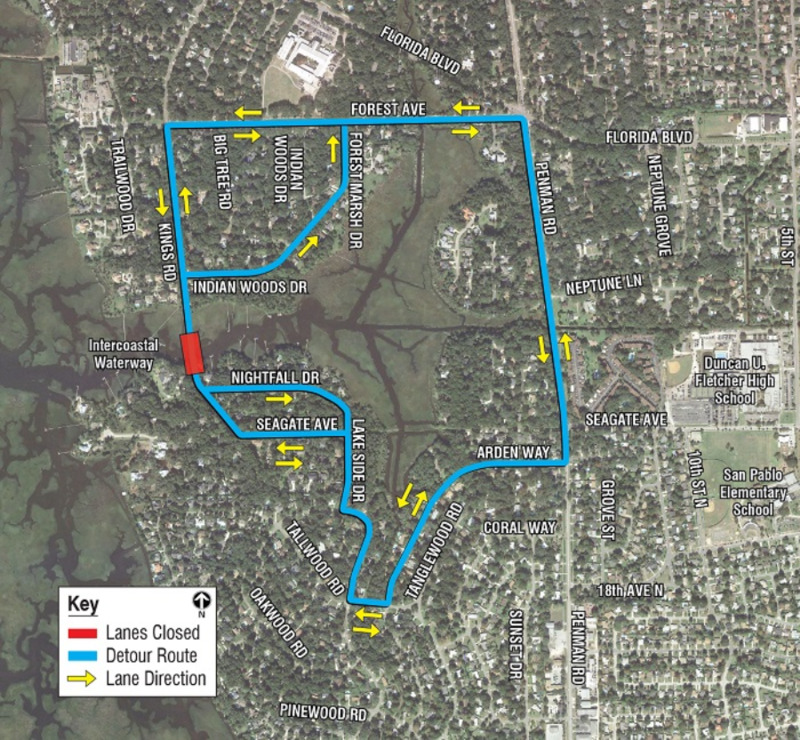 There are five bridges which will be replaced in conjunction with the channel work (Kings Street, 5th Street, Seagate Avenue, 18th Avenue North, 15th Avenue North). Channel improvements will take place in this pattern to minimize impact to residents. During construction, detours will be required. Scheduled detours will be posted on this website, the FDOT weekly lane closure report and message boards will be used to notify drivers.